Remember when you were little and you made cards for you mom and grammy? It was so fun and satisfying, and even though moms are obligated to gush over so-called art projects, she loved that card. I still have the ones my kids made for me back when they were cute. There are so many beautiful, hysterical and eloquent cards to choose from these days that it’s becoming difficult to choose just one for that special occasion. Now you can skip the shopping and make your own using a kit or just goodies you already have around the house. My friend Ilene likes the idea of sewing on paper, her favorite “DIY” is adding buttons to, well, almost anything. I was recently bingeing at Paper Source (designer eye-candy without the calories) and I bought a couple of cards that I couldn’t resist because they were beautiful AND had the Eff Word, the total package. I design cards for a living but at the mass production level so I got inspired to create my own hand made thank you notes. 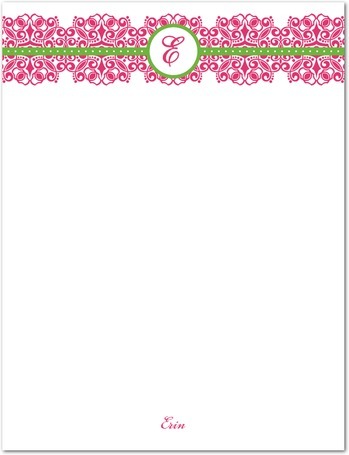 I’m going to order custom printed notes cuz they are easy and inexpensive these days, then I’m going to add glitter. Lots of glitter. And maybe some buttons or rhinestones. 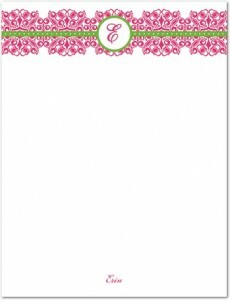 I love this design from TinyPrints.com… and they gave me the option to change the typeface in the monogram, it was easy and fun. This entry was posted on 02/2/11 and is filed under random goodies.